Star trails prove that the Earth does not move, and that an 'outer shell' of stars rotates around the north and south celestial pole. Take photographs every 10/15 minutes without moving the camera AT ALL! You should now have your own star trail photograph. If you haven't got the equipment to do this yourself, there are millions on the web. The false and rather dumb explanation as to why these images are produced is said to be the rotation of the Earth around its axis. This is not true, and here is why. Not only is the Earth supposed to rotate once every 24 hours, it is also meant to travel around the Sun once every 365.25 days, in effect, the Earth is said to behave in a similar motion to a fairground waltzer carriage with the Sun at the centre. The supposed rotation of the Earth is said to produce a 15 degree arc every hour (360 degrees divided by the 24 hours). At the North pole virtually no distance is covered (more like standing on a revolving platform). At the equator the distance 'travelled' in one hour in meant to be 1670 km, (40080ish Km of the equator / 24 hours). This movement of up to 1670km/hr is the explanation given for the star trail. Yet, in this same length of time (1 hour) Earth is also meant to have travelled 108,000 km on its journey around the Sun! That is more than 64 times the distance that is said to be photographed on a star trail picture. Why is this far greater movement not reflected in the star trail photograph? Answer - simple, because the movement does not take place. This example is suited to those who have a planetarium handy. Planetariums are usually designed with a rotating sky (exactly like the real thing). 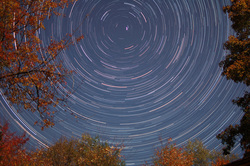 Mount your camera and produce a star trail photograph as described above. Now, clear the floor and install a funfair waltzer ride. Ask the planetarium operator to freeze the moving stars so that you are certain that they are not moving. Setup your camera in one of the carriages on the ride. Start the ride and now create your star trail photograph. Chances are it is not the nice circular variety! OK, this option isn't open to many people, but you certainly get the idea. The actual fact of the matter is this. The stars rotate around a fixed Earth. The star trail photographs show us that something is moving, and that something cannot be the Earth. This also means that the Earth is not orbiting the Sun (if the Earth does not rotate but we experience day/night then the Sun must orbit the Earth, just like we see the Moon orbit the Earth). In turn, this means that the tissue of lies built upon this heliocentric (Sun centred) deck of cards collapses. The universe did not spring out of nothingness, all by itself, 4.6 billion years ago. Life did not 'happen' all by itself. Humans were not primates, fish, or pond scum at any point in their lineage. The Earth and Universe was formed exactly like the Word of God says it was in the Holy Bible. This site will expand to refute more heliocentric nonsense as it becomes necessary. There are plenty of existing excellent sites that tackle most aspects.